The machine is equipped with 6 specially designed stainless steel nozzles. These nozzles are mounted on an anodized aluminium plate with a long slot hole for the adjustment of the center distance of the nozzles to suit a wide range of bottles. The filling principle is by a pump, transferring the product through a specially designed nozzle into the bottle to be filled. Most suitable for soft bottles of rectangular, or flat in shape. 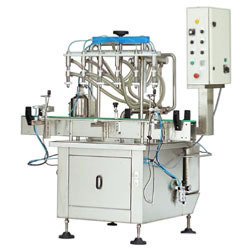 This machine is equipped with 6 specially designed non-drip stainless steel nozzles. 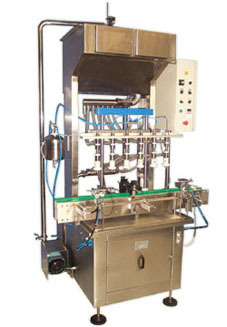 Complete with a 16 feet stainless steel conveyor with 3-1/4″ width stainless steel table top chain and a 1.0 HP variable speed drive unit for the feeding of the containers to the filler. A product buffer tank of 60 litres capacity at the lower portion of the machine with high/low level sensor and stainless steel pneumatic rotary actuator product inlet valve. Together with this buffer tank is a stainless steel centrifugal pump for the supply of product to the overhead stainless steel tank which will delivered the product by gravity through a pneumatic actuated control valve and to the filling nozzles. Most suitable for filling products into soft bottles of rectangular or flat in shape.